In the 1930s, apartments in the block across the river from the Kremlin were allocated only to senior officials and the Soviet elite, but when many of them fell from favor, a grim new episode in the building’s history began. 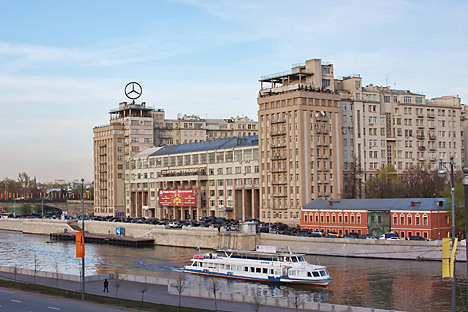 The “House on the Embankment” is one of the symbols of the Stalin era – a huge apartment block across the river from the Kremlin whose apartments were allocated only to senior officials in the 1930s. So it is not surprising that the whole of its facade is now covered with memorial plaques. However, not all those who are thus commemorated died a natural death. Many were arrested during Stalin's purges, and many were executed. Entrance 11 and the apartments in it were closed to the public. Nobody lived there and nobody knew what was going on there. It was believed that it housed a secret residence of the NKVD (the secret police), allowing them to listen in on all the officials living in the apartment block. The House on the Embankment was home to Joseph Stalin's children: His daughter Svetlana Alliluyeva lived in Apartment No. 37, while her brother Vasily Stalin’s home was accessed via the entrance next door. Another famous resident of the building was Alexei Stakhanov, the miner who mined record amounts of coal (14 times his shift quota), starting off the Stakhanovite movement, as workers in different industries began to exceed productivity targets. Production turned into a sport, while Stakhanov himself was taken from his mine in Luhansk, brought to Moscow, given a flat in the famous apartment block and made into a symbol of the era. He was often seen sitting by the fountain with his accordion, drunk, entertaining passing neighbors with miners' songs. Heavy-drinking celebrities were nothing new for the residents of the famous house. Legend has it that the head of the NKVD, Nikolai Yezhov, when under the influence, would dance in the hallways in his socks. Nikita Khrushchev's mother could often be found sitting on a bench outside the building, eating sunflower seeds. Her son, who at the time was one of Stalin's aides, had brought her to Moscow from a village and she retained most of her rural habits and lifestyle. When Stalin's purges began in the second half of the 1930s, whole families here were arrested. About one third of the residents, some 800 people, were taken. The procedure was always the same. At night, usually in the early hours, NKVD officers would arrive in black cars (known as voronki) and quietly, without much ado, arrest people. Many apartments acquired a bad reputation, as several waves of their inhabitants ended up arrested. According to the director of the House on the Embankment museum, Olga Trifonova, some apartments saw their tenants replaced up to five times in the late 1930s. One family would get arrested, then another one would move in and later get arrested too and so on. However, more often apartments would just be sealed. By 1938, some 230 of the 500 apartments were sealed and their inhabitants arrested. By the late 1930s, the House on the Embankment had earned a very sinister reputation indeed. Yet just several years before, the most famous and prestigious apartment block in the country had been a welcoming sight, lit up from the ground floor upwards, with music and animated conversations streaming from its windows. Luxury cars would pull over outside it and beautiful women in furs would step out of them. However, soon all of that disappeared without a trace. After Stalin's death, the House on the Embankment for many years lost its status as a symbol of an era. It continued to accommodate senior officials - high-ranking civil servants, generals, prominent scientists - but everything was very quiet, nobody was arrested, and nobody jumped out of the windows. After the break-up of the Soviet Union, apartments in the House on the Embankment became very popular with the nouveaux-riches, who had made a quick fortune during the stormy period of Russia’s transition to a market economy. The sinister history of the building witnessed a new chapter: In the wild 1990s, the country's business circles were waging gang wars and many of the new owners of apartments in this building were killed. However, they were people of a somewhat lesser caliber than Stalin-era officials and their histories have failed to leave a lasting trace.